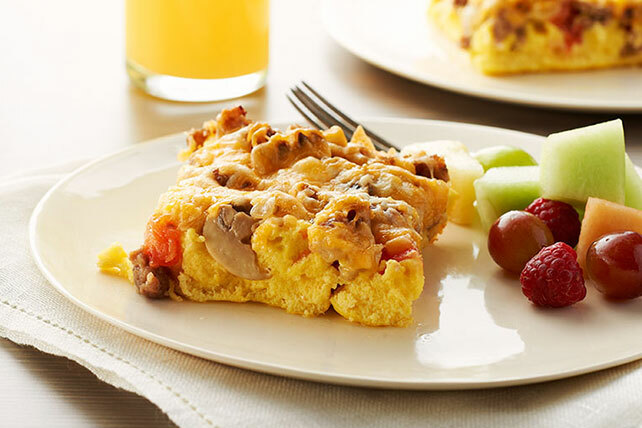 Enjoy this Sunday Egg Brunch Bake filled with cheese, onions, mushrooms, tomatoes and sausage. This egg brunch bake smells so good as it bakes. Whisk eggs and sour cream until blended; pour into 13x9-inch baking dish sprayed with cooking spray. Bake 10 min. or until egg mixture is softly set. Meanwhile, cook sausage, mushrooms and onions in large skillet on medium heat 6 to 8 min. or until sausage is done, stirring occasionally; drain. Bake 30 min. or until knife inserted in center comes out clean.